The copious folds of this greatcoat proved ideal for keeping a gentleman warm outdoors, especially when riding. It would have been worn over at least one coat and the tailor has allowed for this in the generous cut. The waist, chest and sleeves are particularly roomy, giving the wearer freedom of choice in his dress and ease of movement. The tailor has also ensured that the ample skirts are very long. They cover the knees and much of the calf for extra protection. As with most early 19th-century coats, there are distinct references to former styles of tailoring. 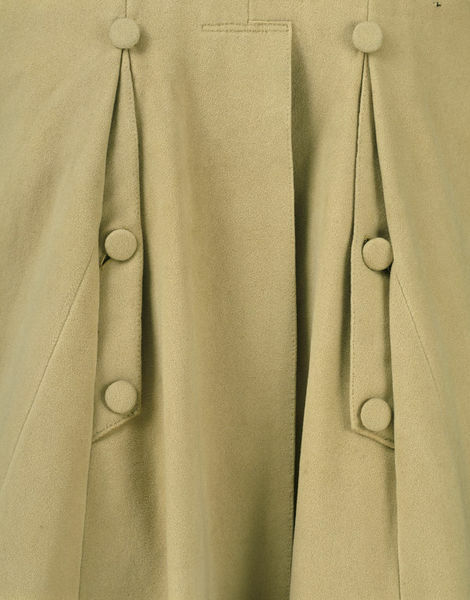 The hip buttons, positioned on either side of the centre back vent, are inherited from the end of the period 1600-1700. They serve as ornamental headings to the back pleats which resemble the sword vents on 18th-century coats. The two vertical flaps that project from the skirts of these pleats are known as skirt pockets. They fasten with buttons to discourage pickpockets. Greatcoat of buff superfine wool. Long loose coat fastened down the front with eight buttons from neck to waist. 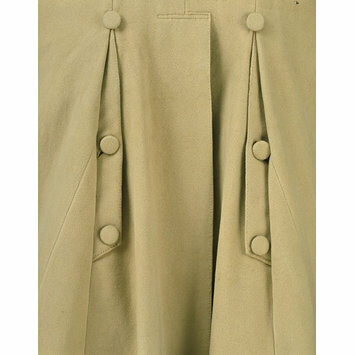 With flapped pockets at the waist and hip buttons positioned on either side of the central back vent and pleats. The cuffs are deep and the coat has a pointed, turn down collar that is wide and set low. The pockets have rectangular flaps and are set horizontally. The sleeves are slightly shaped with slight fullness at the shoulder. The sleeves and pockets are lined with unbleached linen. Hand-stitched. Displayed in the V&A Costume Court 1962 - 1979.